Native Americans named the Tennessee River that rolls through The Shoals area The Singing River. The Singing River Waterfalls Day Trip features Coldwater Falls as the centerpiece of beautiful Spring Park in Tuscumbia and the beautiful Wilson Dam waterfall. 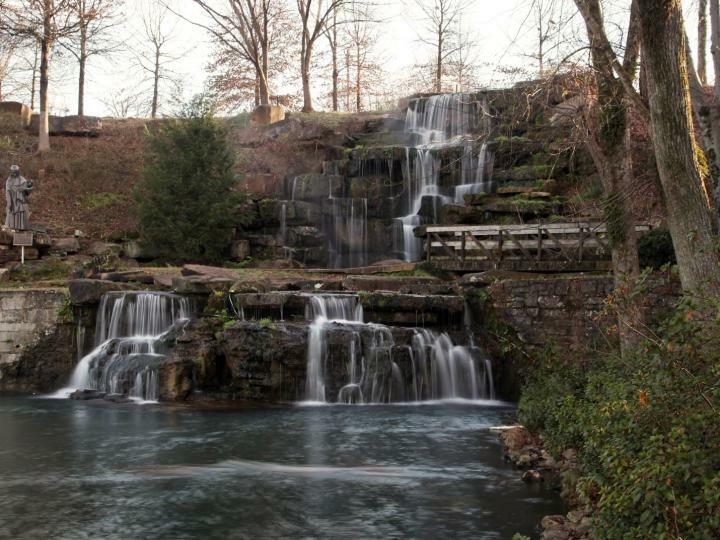 Coldwater Falls is the centerpiece of beautiful Spring Park in Tuscumbia. The falls is a man-made waterfall that is constructed with over 2,000 tons of sandstone. It stretches 80 feet wide and is 42 feet tall. Each day over 4.3 million gallons of water flow over the falls. Wilson Dam waterfall is on a high rock wall adjacent to Wilson Dam on the south bank. Small feeder creeks run through the natural area and create this waterfall on an adjacent cliff wall. 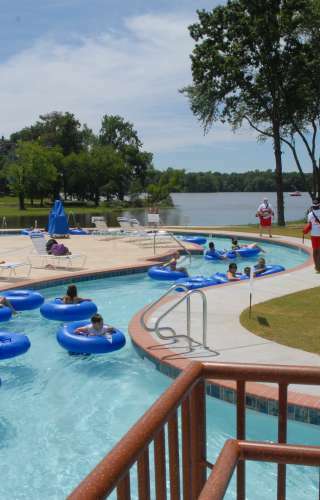 Spring Park provides the perfect atmosphere to enjoy a family picnic with playground and children’s amusements, including a train, carousel, roller coaster, and splash pad. Food vendors and restaurant dining available in the park. Open daily, year round. Helen Keller Home, Gardens and Museum is located just a couple miles from Spring Park. The plantation home and birthplace cottage, dating back to the 1820’s are listed on the National Historic Register of Historic Places. Original furnishings of the Keller family decorate the home and museum, highlighted by hundreds of Miss Keller’s personal mementos, books, and gifts from her lifetime of travel and lectures for the betterment of the world’s blind and deaf-blind. Alabama Music Hall of Fame honors the outstanding achievements and the music of Alabamians. You’ll hear rocking rhythms and soul touching melodies as you admire the vast memorabilia from the lives and careers of more than 1,000 stars, representing all styles of America’s music. FAME Recording Studios, established in 1959, was the first successful, professional recording studio in Alabama. Arthur Alexander’s 1961 hit, “You Better Move On,” cut here, launched the famous Muscle Shoals sound. The internationally acclaimed documentary, Muscle Shoals released in 2013, told the story of FAME and its founder, Rick Hall. Cypress Moon Studios, founded in 1978, was the second location of the legendary Muscle Shoals Sound Studio for over 25 years, where the “Swampers” continued to record hits after moving from their Jackson Highway location. Recording artists including Bob Segar, Bob Dylan, Lynyrd Skynyrd, Dr. Hook, Etta James, Clarence Carter, Julian Lennon, Glenn Frey, and countless others. Tuscumbia Railway Depot & Museum is 1888 restored passenger depot that was utilized by both the Memphis and Charleston and Southern Railway companies. Today, it is a museum dedicated to its memorabilia. Tuscumbia boasts the first railroad west of the Appalachian Mountains. Wilson Dam boasts one of the highest, single-lift locks in the world. Construction on the dam began during World War I, TVA was created in 1933. The lock is accessible to visitors Fridays, Saturdays, Sundays and federal holidays from 7 a.m. to 7 p.m. throughout the year.